Welcome to the first of the "Welcome to Firestorm" posts. 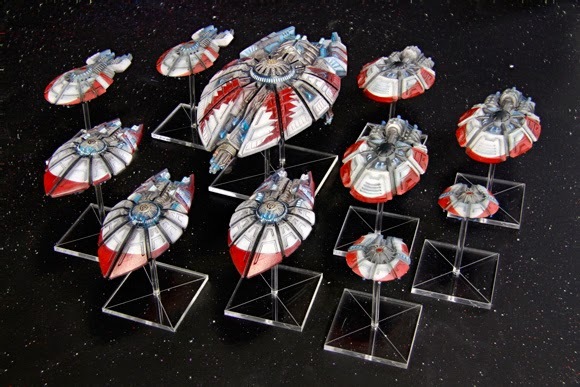 The aim of this post, and the ones that follow, is to introduce new players who are unfamiliar with the Firestorm universe to Firestorm lore and perhaps inspire a few people to start a Firestorm fleet. First up is the overall story of the Firestorm universe. The story of the Firestorm universe starts as many sci-fi universes do. Humanity experiences a golden age of technological advancement and colonises much of the galaxy. As they explore humanity came into contact with alien races, namely the Aquans, the Relthoza and Sorylians,and fought a war with these races that became to be known as the Wars of First Contact. Humanity won those wars and it was with those victorys that they were able to carve out their empire. They spread out amongst the stars at a stunning rate, ever expanding and exploring into places like the Storm Zone and the Outer Reach, areas of the galaxy that would become key in future events. The Terrain Satellite Charter (as this empire expanding effort was known as) would be considered a success, however this golden age wouldn't last. Soon the colonists at the far flung reaches of the empire (notably the colonists in the Outer Reach) grew tired of over bearing Terran control, and being ruled be people half a galaxy away. Lead by Ignatius Rense the colonist rebelled against Terran rule from their home world of Dramos far in the Outer Reach. And while the First War of Secession was eventually won by the Terrans they made a fatal mistake, they didn't properly put down the rebellion and allowed Rense to live. A short while after First War of Succession several Terran corporate giants bought their freedom from the empire in return for supplying arms and equipment for any future wars against the colonists. These corporations would become known as the Directorate and would soon jump sides and join the colonists, who were very wealthy due to vast reverses of natural resources located in the Outer Reach where they were based. A century after the First War of Succession Ignatius grandson Markus Rense tried again, this time the colonists were better prepared, with better ships and a century's worth of stock piling Directorate gear. Round 2 would prove to be vicious and bloody than the first, with vast war fleets tearing each other part in a brutal civil war. However the worst was yet to come, as the war reached its climax a Terran fleet attacked Dramos and destroyed the planet in nuclear fire in a last ditch attempt to crush the rebels with brute force and cow them into submission. Never has such a move back fired more, confronted with this horror the colonists fought harder than ever to avenge their home world and would eventually go onto win the war. The colonists would rename themselves the Dindrenzi Federation and would claim the whole of the Outer Reach as their own. 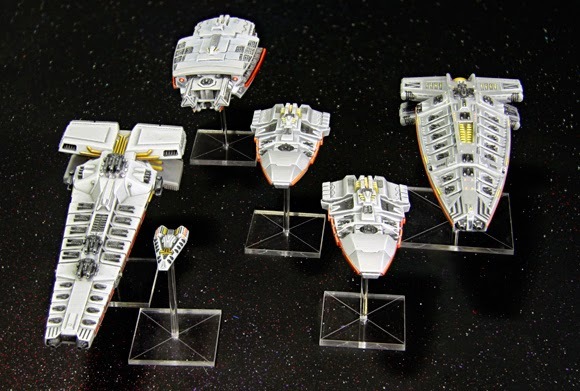 As the fleets fell silent an uneasy peace descended on the galaxy. For the Terrans it was a time of counting their loses and consolidating what they had left, during this time they founded alliances with the Aquans and the Sorylians, mainly for protection against the Dindrenzi who, while on paper were meant to be at peace with the Terrans, still seethed from the destruction of Dramos and were suspected of gearing up for Round 3. Over time the Terrans drew more races into their alliance, which was to become know as the Kurak Alliance, and would include such races as the Terquai and companies such as Hawker Industries to name but a few of the Alliance's member. Bizarrely despite beating the Terrans and other Outer Reach races such as the Relthoza the Dindrenzi feared retribution from the Terrans and began to gather other Outer Reach factions and races to their side. The Directorate and Relthoza were the big two backers of the Dindrenzi and formed the core of what was to be known as Zenian League. However the League was soon to be joined by others such as the Works Raptor company, who amongst the companies of the Directorate stood out for their blood thirsty and psychopathic ways, and the Ba'Kash, a race of alien pirates and raiders who have been lured to the Zenain League by promise of the loot. And now a century after the Dindrenzi won their freedom war has returned. The Kurak Allaince and the Zenain League have gone to war, with the Dindrenzi and Terrans seeing only each other in this conflict, each human nation desiring to right previous wrongs. In the galactic south the Relthoza have given into to the urge to expand and conquer that has been building in their race for some time and now their vast warfleets hammer into Sorylian controlled space. 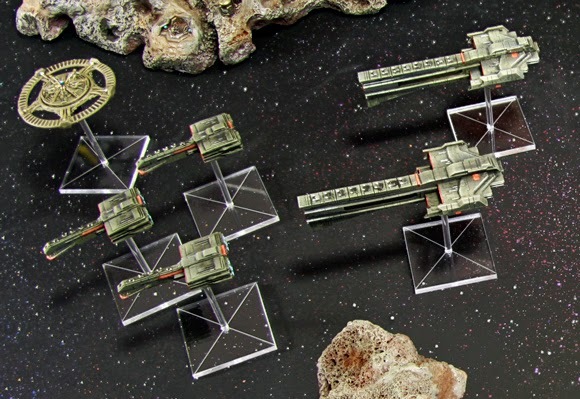 Meanwhile the fleets of the Directorate, always eager for more plunder and profit have launched attacks against the Aquans with only the wost human motivation of greed driving them forward, seeking new systems to raid. War has returned and there are no signs of it letting up in the near future. So there you have it, the first of my Firestorm lore posts. Hopefully that provided and brief and informative summary of the general Firestorm lore, and the Spartan Games website has more information if you are interested in learning more. Next up i plan on doing a detailed lore post on each of the 6 major factions followed up by tactics posts for the Dindrenzi, which is the faction i play. Until next time.